Healthy brakes are not only important to your car but to the safety of you, your passengers and other road users too, so it’s important to keep them performing well. But how do we know that they are effective, and when should we look at things like brake pad replacement? Fortunately, brakes are one of the features that are inspected during your car’s annual MOT, scheduled service and at free brake checks at most garages. With so many ways to actively monitor your brakes, there really is no excuse for your car to be running with insufficient braking power. In fact, if poorly maintained brakes are found to be the cause of an accident, you could be liable for any damage or injury caused. It’s helpful, therefore, to be prepared for any recommended maintenance or intervention, such as disc or brake pad replacement: How much does it cost? How do I know my car requires brake attention? When and where can it be done? Has Your Car Reached Braking Point? As well as professional brake checks carried out by qualified automotive technicians, you can also use your own eyes, ears and hands to keep track of your brakes. For example, if your car is pulling to one side when you brake or if the brake pedal feels spongy when you press it, this could be a sign that your brakes need looking at. Rattling or grinding can also be an indication that something isn’t quite right. Don’t delay, take your car to a qualified technician straight away! Commonly today’s cars usually have disc brakes at the front, where most of the braking force is applied and drum brakes at the rear. As the brakes are applied, wear occurs to the brake discs as the pads are applied to them. If this occurs unevenly, the car will pull to one side when the braking force is applied. The grinding noise is a common sound of a naked caliper (usually protected by a brake pad which has now worn away) scraping against the disc, causing scoring and damaging the disc, requiring immediate attention. If your car brakes are flagged up as having an issue during an inspection - MOT or otherwise - there are many components that might be to blame. Most commonly, it’ll be brake pads, discs or fluid. How much should brake pads and discs cost? Of course, as well as maintaining your car’s safety, you can prevent more expensive damage to your vehicle by keeping on top of brake maintenance. 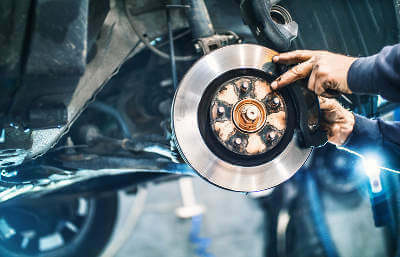 Both pads and discs replacement needn’t be completed at the same time since taking care of your car’s brake pads can prolong the life of the discs. Due to a wide variation in driving styles and other factors such as vehicle weight, some cars will travel up to 70,000 miles without needing brake parts replacement while others will make it to only 25,000, so it’s impossible to say how often these parts will need replacing. No matter how well you look after your car, if you are travelling the average annual mileage of 12,000 you should you should budget for brake pad replacement every 2-3 years which may help you avoid the cost of most expensive brake disc replacement. It should also be noted that any professional mechanic would suggest it's best practice when changing the brake discs to change the brake pads. Our network of garages will always advise on having both replaced when changing brake discs. Using generic parts will lower the cost of changing brake pads and discs only slightly as it’s the labour that makes up the bulk of the cost. The other main culprit of car brake problems, the brake fluid, isn’t included in the MOT but is usually addressed during your car’s routine service when the level should be checked and, where necessary, appropriately topped up at a cost included in the service price. Ideally, brakes should be inspected at least twice a year so, between your car’s service, MOT and free checks that are available at service centres, you’ll be able to keep your brakes in tip-top condition. How to change disc brakes? Step 1 Remove the wheel Always use a flat level surface & put the handbrake on, jack the car up and remove the nuts and wheel to access the brakes. Step 3 Put new brake pads on fit the new pads into the bracket, use copper grease for the back of the brake pads. Step 6 testing the brakes ALWAYS test the brakes and brake the pads in slightly and advise the customer of this. If you suspect that your car might need a little brake attention, get a quote for an immediate check by one of MyCarNeedsA.com’s local, vetted service providers. Choose from a number of quotes at a convenient location to suit your schedule and give you peace of mind on the road.